how active are you? | maya c.
I read this article a few days ago and did my calculations... and then I nearly had a heart attack. It appears I sit or lie (translation: am generally inactive) for almost 90% of my day. Something tells me our bodies weren’t designed for 90% inactivity. Perhaps that’s one of the reasons a lot of us have such low energy and ache so much. … so here’s my next 30-day challenge: a minimum of 15% activity per day. That’s only a 5% increase, but that roughly translates to 3.6 hours per day. With a full time job and a third of my time taken up by sleep, I’m going to have to get creative about this! How active are you? 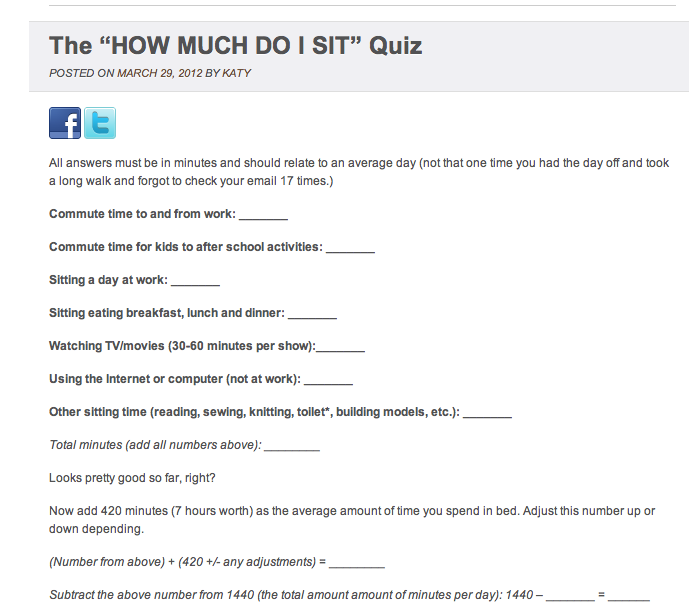 I dare you to do the quiz… like now! < Previous cheap eats and clothing swaps!